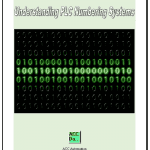 Data logging is the ability to save and view data from the PLC in a format that we can utilize elsewhere on the network. The Horner APG XL4 has this feature in its design to periodically log registers to removable media. (Micro SD) This data is stored in .CSV (comma separated value) format which is compatible with many computer applications such as Microsoft Excel. Horner provides one of the easiest methods that I have seen to get data logging. You can log 30 registers in a log group and have 10 separate groups. Each group has its own configurable timer that determines the automatic reading and logging of the variables (registers). The group also has a manual trigger bit that can be set to log the variables. This all in one controller provides the easiest way to log data. 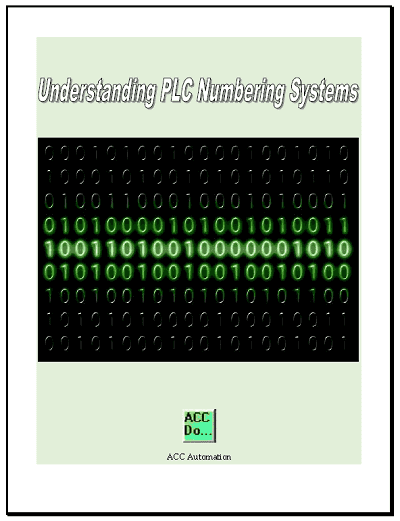 We will look at how to configure and utilize this feature of the PLC. 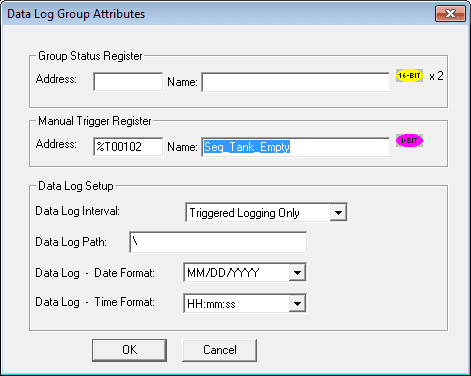 Using our existing process tank application we will now setup data logging to our micro SD card. This will call up the Data Log Configuration window. 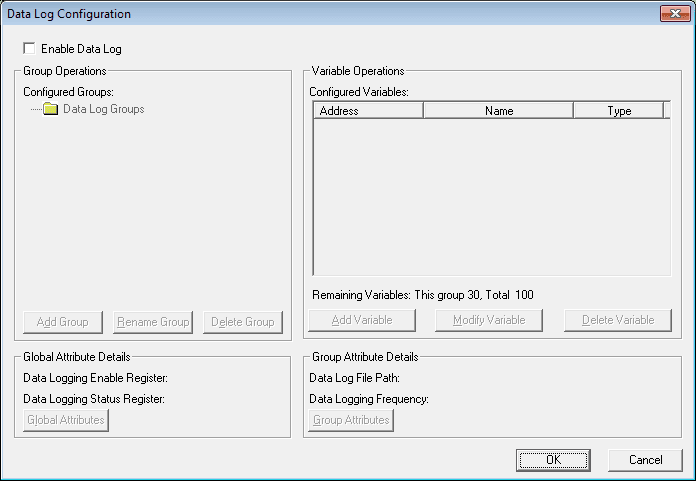 Select the Enable Data Log. This will enable all other options. Select the Global Attributes. This will allow us to set the attributes that apply to all of the data logging required. The second register will show the percentage full of the media card. Our example will use %R3000. 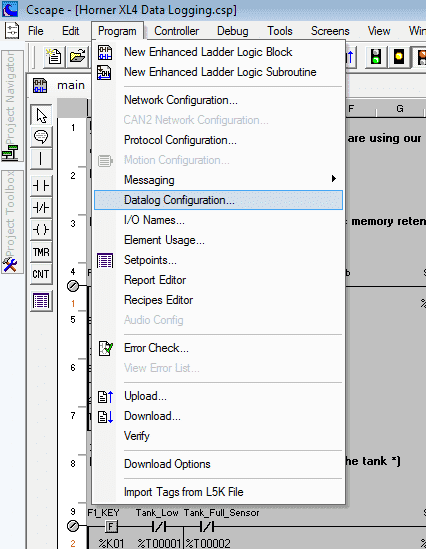 Click OK to return to the Data Log Configuration. You will notice that the Global Attribute Details will display on the screen. This group name can be 8 characters in length. Once a name has been entered select OK.
Our name entered was PTank representing our process tank. Highlighting the name PTank will now display the variables that we can set in this group. Under the Group Attribute Details, select Group Attributes. Group Status Register – This is optional and is the same as the Global Status Register. Manual Trigger Register – This is optional to record the log information. In our case we will be using the Sequence Tank Empty to detect the end of the cycle so we can record the product cycle complete. 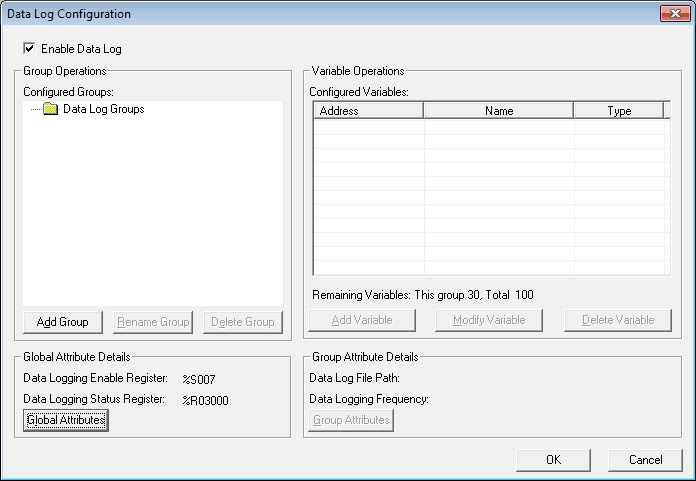 Data Log Setup – This has several parameters to determine how and where to record. 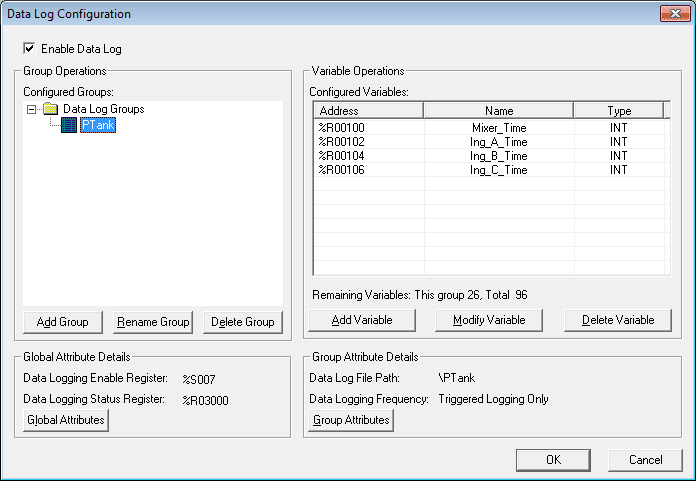 Data Log Interval – This selection can be set for Minutes, Seconds or Trigger Only. We will set this for trigger only because we want to record when the cycle is complete. Data Log Path – We can specify where on the micro SD card that the information will be logged. The default is in the root directory. Date Log – Date Format – This is the format of the date that is recorded every time that the information is logged. Date Log – Time Format – This is the format of the time that is recorded every time that the information is logged. Select Add Variable. We will not tell the controller what parameters that we would like to log each time the trigger activates. 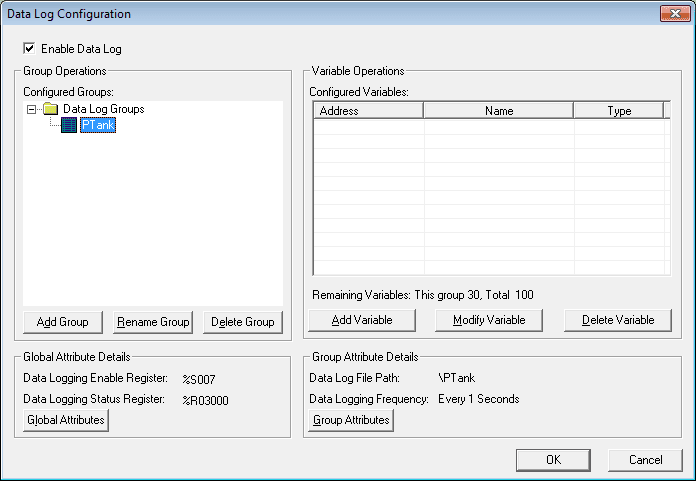 Adding each of the variables and returning to the Data Log Configuration Screen our group is now complete for PTank. Our data logging is now complete. We can now run the program and see our results. 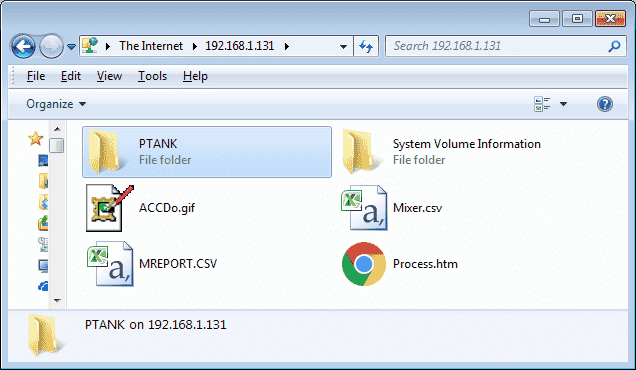 Using FTP we can log into the directory. 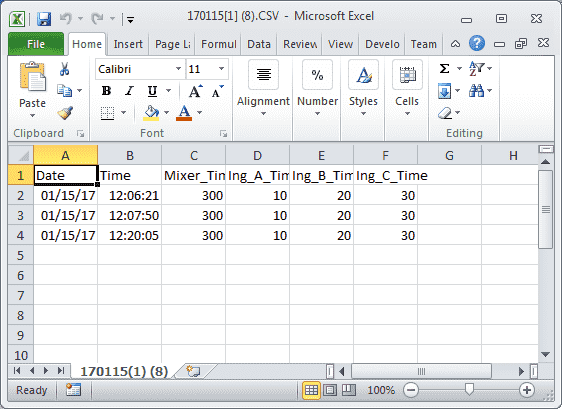 Select the 170115.CSV file. In my case this extension defaults to the Microsoft Excel program. 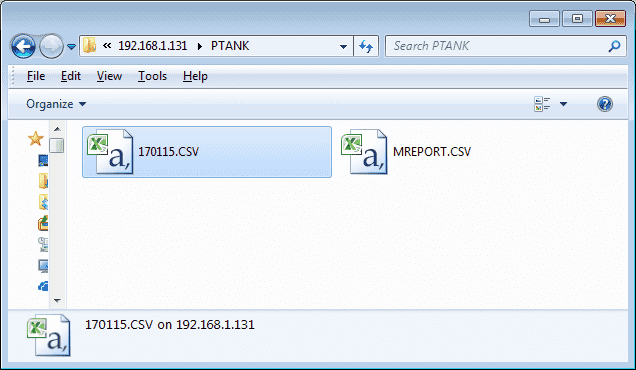 Alternatively you can call up your program that will read a CSV file and view the contents. This ends our series on the Horner APG XL4 all in one controller. We have covered a great deal of the features of this controller; however these features are constantly changing with each new release. Please refer to the Horner website for tech notes and other offerings. Thank you for viewing this series.